IDF Chief of Staff Aviv Kohavi on Wednesday ordered troops along the Gaza border to remain on alert for “various scenarios in the region,” the army said, as Israel prepares for what it fears will be a violent weekend, coinciding with the first anniversary of the Strip’s “Great March of Return” border protests. This week has seen tensions peak between Israel and the Gaza-ruling Hamas terror group, with massive exchanges of fire. Throughout these bouts, Egyptian military intelligence has been working to try to broker a ceasefire. Israel is reportedly demanding an end not only to rocket fire but to all violence along the border, including regular riots along the security fence and the launching of airborne incendiary and explosive devices into Israel. The London-based Arabic newspaper Asharq al-Awsat reported Wednesday that Hamas conditioned an end to all violence on a wider and more comprehensive agreement to lift the blockade of the Strip, which Israel says is in place to prevent arms reaching the terror group. Israel has conducted three military campaigns against Hamas, which is sworn to the destruction of the Jewish state, since it took power in a violent coup in 2007 — a small ground operation in 2008-2009, known as Cast Lead; a largely aerial campaign in 2012, known as Pillar of Defense; and the 50-day Operation Protective Edge in 2014, which targeted the terror group’s attack tunnels. 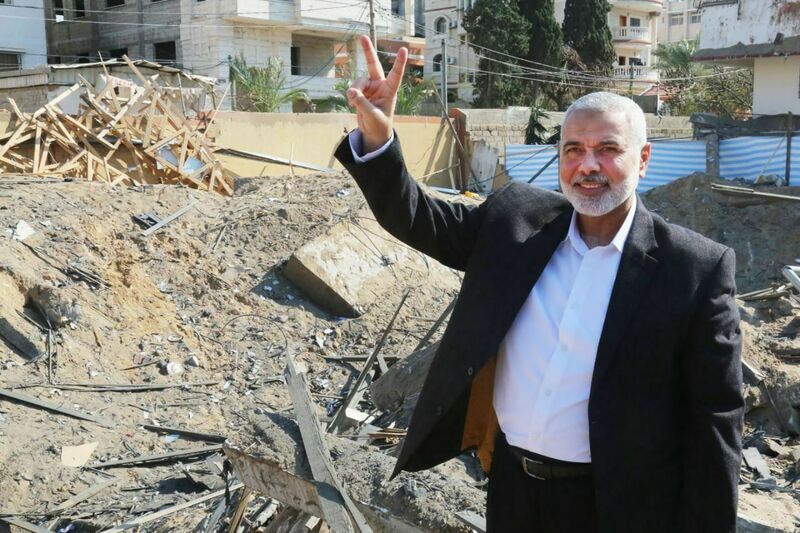 On Wednesday afternoon, Hamas chief Ismail Haniyeh came out of hiding for the first time since fighting began and visited the rubble of his office, which was destroyed in an Israeli airstrike on Monday night. In a statement to the press, the chairman of the terror group’s political wing said Israel “got the message” during its latest round of attacks. Palestinian Land Day marks a 1976 decision by the Israeli government to seize thousands of dunams of Arab-owned land in the Galilee region of northern Israel. Last year on Land Day, Palestinians in the Gaza Strip launched the “Great March of Return,” a series of weekly protests and riots along the security fence. Israel maintains that Hamas appropriated the campaign for nefarious purposes, using the civilian protesters as cover for violent military activities. 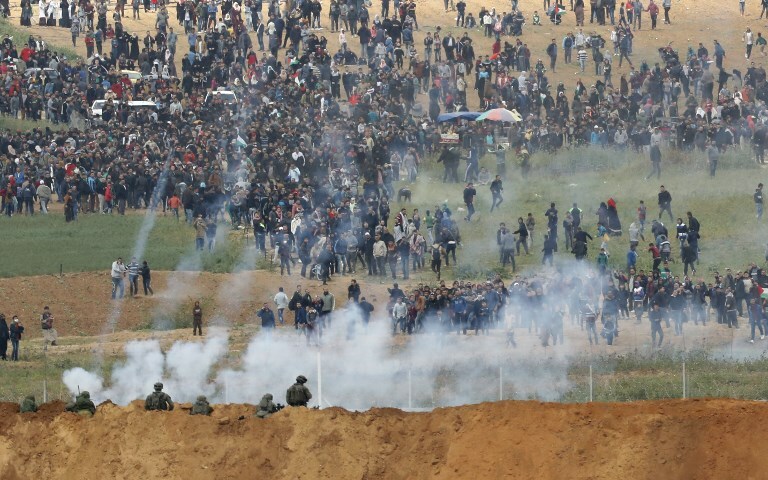 The Israeli military is concerned that the one-year anniversary of the first March of Return on Saturday will bring tens of thousands of rioters to the Gaza border threatening to breach the security fence and enter Israeli territory en masse. Israeli defense officials — as well as Hamas’s political foe the Palestinian Authority — accuse the terror group of encouraging these border riots in an effort to distract from its failures in governing the Gaza Strip, a crowded patch of land with crushing unemployment, limited access to electricity and potable water, and few economic prospects. 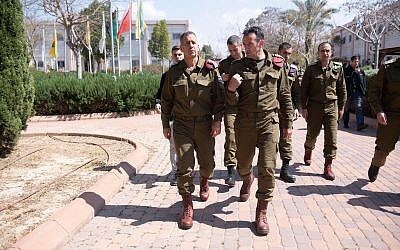 On Wednesday, Kohavi visited the Gaza Division, which defends the border area, and met with its commander, Brig. Gen. Eliezer Toledano, along with Southern Command chief Maj. Gen. Herzi Halevi. “During their situational assessment, the chief of staff demanded the troops be prepared for various scenarios in the region,” the army said in a statement. The military said that especially applied to the infantry, armored and artillery reinforcements that were recently sent to the region. 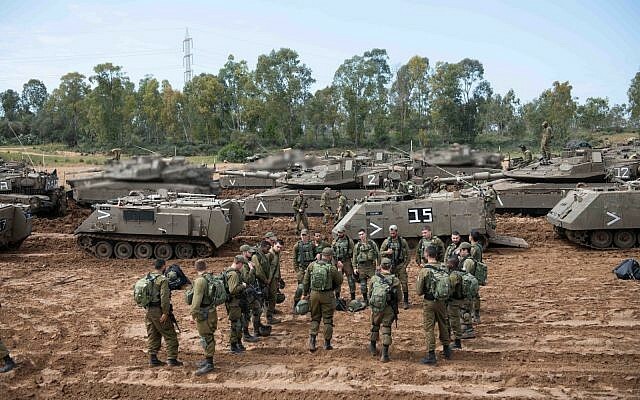 On Monday, the Israel Defense Forces already deployed two additional brigades to the Gaza border region and called up approximately 1,000 reservists for air defense and other select units. 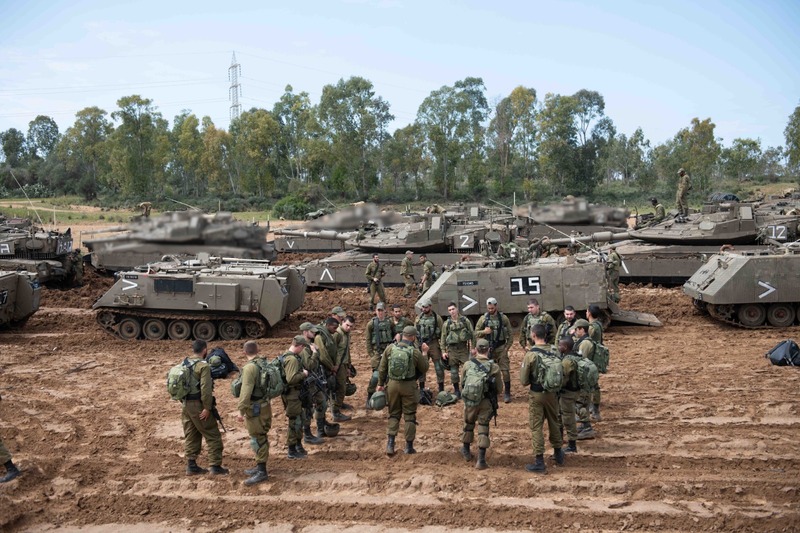 The next day, Kohavi called for an additional artillery battalion and the command unit of the Paratroopers Brigade to be deployed to the Gaza region. He also ordered the call-up of more reservists and canceled plans for soldiers currently stationed in the Gaza Strip to move to other regions in Israel, the army said. Two rockets were launched overnight Tuesday toward the city of Ashkelon and an industrial park south of the city, with both intercepted by the Iron Dome missile defense system, the army said. No injuries or damage were reported. 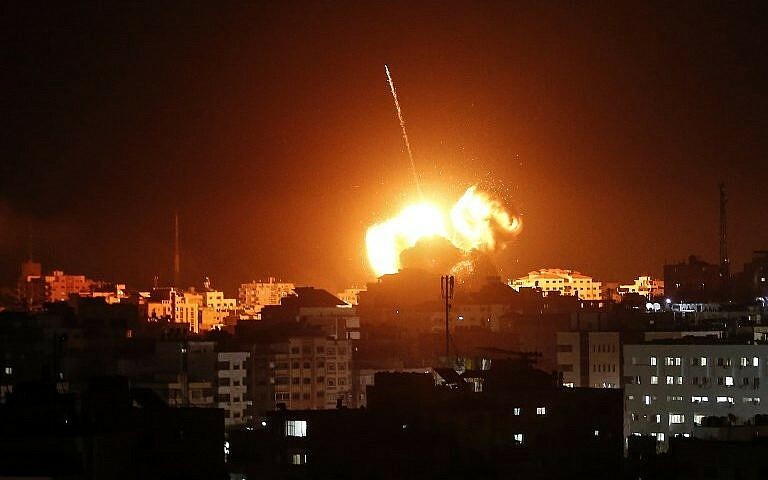 The rockets were fired shortly after the Israeli Air Force launched strikes against Hamas targets in Gaza in response to an earlier rocket attack aimed at the Eshkol region, despite claims by Hamas that the rocket had been fired by a small radical salafist group. Israel holds Hamas, the Strip’s de facto rulers since 2007, responsible for any fire emanating from the coastal enclave. In its statement, the IDF said its strikes were in response not only to the rocket fired at the Eshkol region, but also to the launching of several airborne incendiary devices earlier in the day and a cross-border arson attack in which several Palestinian breached the Gaza security fence and set fire to an abandoned Israeli sniper’s nest. Tuesday night’s violence came amid an unofficial ceasefire between Israel and the Hamas terror group, following a large flareup that began with a rocket fired from the Strip Monday morning that flattened a home in a farming community in central Israel, injuring seven people, including two small children. In response to the rocket strike, the Israeli military launched a series of airstrikes in the Gaza Strip, destroying dozens of targets including the office of Hamas chairman Haniyeh, who had fled the building, and other locations that the military described as strategic assets for the terror group. Throughout the Israeli bombing campaign, terrorists in the Strip launched at least 60 rockets and mortar shells at southern Israel, causing no injuries but some damage to buildings in the southern town of Sderot.